On 28 August 2014, the NSW Government declared a $2 billion redevelopment of the heritage precinct of North Parramatta, with the area named as a state significant site. The development could involve 6000 new apartments in high-rise buildings up to 30-storeys high in a 146 hectare area predominantly inscribed as a UNESCO World Heritage Area. It could also impact adversely on heritage listed buildings and the landscape of the 1848 Cumberland Hospital, the 1818 Female Factory, the 1866 Wisteria Gardens, the 1835 Parramatta Gaol and the 1841 former Roman Catholic Orphan School. See accompanying map overleaf. The Trust seeks specific commitments from the State Government and Parramatta City Council that no development will be proposed within the World Heritage Area (Parramatta Park, including the Parramatta Stadium Precinct) which would adversely impact the World Heritage values of this Area. 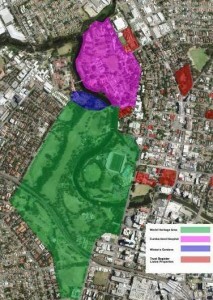 The Trust urges that the archaeology, historic buildings and landscape of the Cumberland Hospital, Female Factory, Wistaria Gardens, Parramatta Gaol and the former Roman Catholic Orphan School be conserved and protected intact and interpreted to serve as a much needed passive recreation area and historic/arts precinct. The Trust believes that new residential development should be sited in the precincts to the east of Cumberland Hospital and in the predominantly single-storey industrial area to the east of Parramatta Gaol, near public transport along Church Street and the proposed light rail route. The Trust understands that there is considerable high-rise commercial/residential tower development proposed within the Parramatta CBD, which reinforces the importance of conserving the 166 year old Cumberland Hospital/Wistaria Gardens landscape intact for future generations to experience and enjoy. Parramatta CBD development must not impact adversely on the World Heritage Area nor should it involve demolition of buildings of historic, aesthetic or architectural significance, including buildings listed on the National Trust Register. The Trust’s Policies on Change of Use and Disposal of State Government Heritage Assets and Public Participation in Planning & Assessment, also have application with regard to development in this area. The Trust calls on its members and the community to support the Trust’s vision for North Parramatta by contacting their local parliamentarians and Parramatta City Council expressing their concern and urging the retention intact, conservation and interpretation of the archaeology, historic buildings and landscape of the World Heritage Area, Cumberland Hospital and the Female Factory, Wistaria Gardens, Parramatta Gaol and the former Roman Catholic Orphan School.